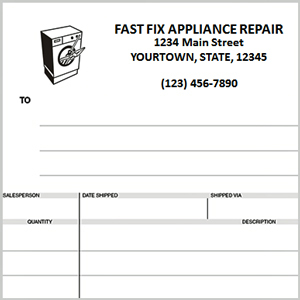 Choose a size below from one of our Custom Appliance Repair Invoices Templates. Choose from 5.5" x 8.5", 8.5" x 7", or 8.5" x 11" custom invoice templates. Customize them with one of our stock logos or upload yours. Add custom information such as your company name, address, phone number, website, terms, remit to, etc. Use our template and make it your own! Choose one of the custom appliance repair invoices online below.